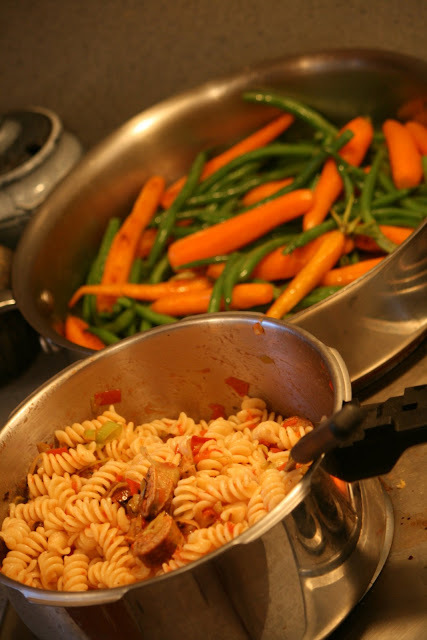 First, I made the pasta, and Don cooked the sauages until they were hot and plump. Then I cut the sausage into slices and put it aside. I put some olive oil in my large saute' pan and saute'd the leeks, cut into little rounds. When they were nice and tender, I added in the tomatoes and peppers, diced, until the leeks were seperated and almost clear and the peppers were cooked through. I tossed the sasuages back into this mix and tossed until everything was good and hot. Then tossed with pasta and added in the provalone cheese, cut into small chunks. It was really really good. I served it with small carrots, pealed, and green beans, both saute'd in butter and tossed with a little bit of summer savory and salt. I made these with Cyan Saturday morning. 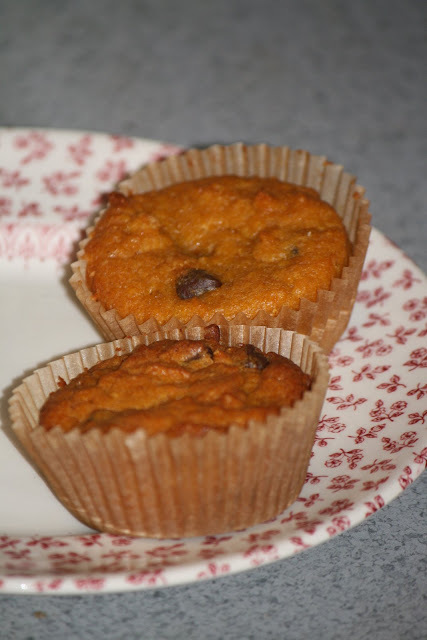 They are this recipe, with WW flour instead of Spelt this time and put into muffin tins. Notice they are on sweet little red flower plates that I found for $.40 a peice at Goodwill. They don't totally match my bowls, but I really liked the compliment... so they are here to stay. And even if they were not, the whole set cost me less than a Pumpkin Spice Latte. Gotta love buying used. Looks yummy! How's Alex's wrist doing? Much better... he gets his cast on Friday and we will be able to see how well it is healing then. I will update with pics and all. Although I don't have pics of the messed up part... which is good. It would gross everyone out. lol!